For the 157 members of the Bexley High School Class of 2018, the commencement ceremony on May 27 marked a major milestone in their lives. 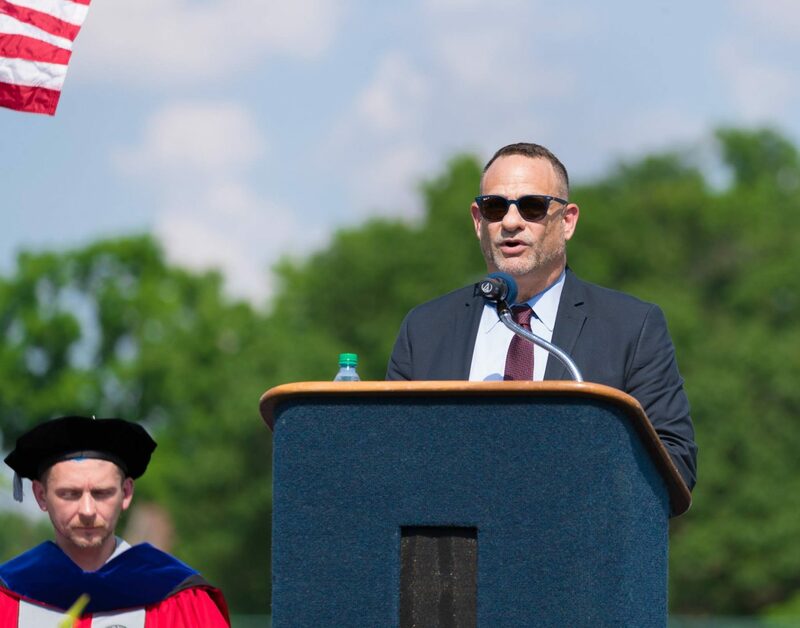 It was also marked the last commencement for BHS principal, Dr. Harley Williams, who has taken on a new administrative role with the school district, and the first commencement for Kimberly Pietsch Miller as Bexley City Schools Superintendent. In a ceremony that followed many traditions, there were non-traditional moments including a keynote speaker who never envisioned that someday he would be the speaker for his own high school. Seniors Ben Haidt and Emily Markham gave the student commencement addresses. Keynote speaker, Joel Goldman, BHS Class of ’81 has traveled across the country and throughout the world giving voice to those living with HIV/AIDS. The invitation, however, to come home to Bexley to speak was deeply meaningful and provided the opportunity to talk about his personal journey. That journey took him from Bexley High School to Indiana University where he graduated with a BS in Public Affairs, a minor in Public Relations and a certificate in Film Studies. Following graduation, Goldman joined the staff of his college fraternity, Sigma Alpha Mu and was on track to become the third Executive Director of the fraternity in its 82 year-old history. That all changed in 1991 when he was diagnosed with HIV/AIDS and told he had only a few years to live. Fortunately, anti-retroviral drugs were introduced and he could spend the next several years “on tour” speaking to more than a million students at high schools, colleges, conferences and for Jewish youth groups, earning praise for his honesty and deeply touching lives in the process. Goldman’s ability to connect with others, including many Hollywood celebrities, led him to fundraising and organizing successful charitable events connected to the entertainment industry. But it was his life-long passion for those living with HIV/AIDS that would lead him to take on his current role as Managing Director role with the Elizabeth Taylor AIDS Foundation. None of these achievements in helping others said Goldman would have been possible without the passion for social justice instilled in him by his parents and the lessons he learned early on, especially when it came to gratitude. He shared that how when he, as a child at Passover dinner at the home of a family friend, responded to the question “what are you grateful for?” by saying he was grateful that he didn’t live in a house with only one bathroom like his host. Rather than scolding him, his father, a Rabbi took him to spend a day with a migrant family he knew whose house had just one room — and no bathroom at all. That humbling experience stayed with him and came full circle when decades later while traveling in Malawi for the Elizabeth Taylor AIDS Foundation, when he was welcomed by families who lived in very similar conditions–with the additional challenge of living with HIV. Goldman encouraged graduates to be bold, not afraid to take chances and break boundaries by thinking outside of the box. Combine that with being grateful and humble, he said to the students and you will find unexpectedly perfect opportunities in life, just as he has.